This website is owned by Smeg S.p.A (the "Company", “Smeg”, “we” or “us”) whose local subsidiary (Smeg (UK) Limited) registered office is at The Magna Building, Wyndyke Furlong, Abingdon, Oxfordshire, OX14 1DZ and our company registration number is 2365886, and we are the ‘data controller’ of the personal information you provide to us. This page is updated as changes to our policy are made. During your visit to our Site, we will only collect personal information that you choose to provide, if for example you: contact us with an enquiry; register on the Site; enter a competition or prize draw; request us to provide you with further information; post information to a public area of the site or take advantage of a promotion. How do we use your personal data and on what legal grounds? Where you have given your permission for us to use your data for particular purposes, or where we send you communications relating to Smeg products and services, you can at any time change your preferences as to how your data is used by us. You can contact us to change your preferences. We may also use information about your visits to our Site to enhance your visit to our Site and to create a general demographic profile of visitors. However, once your session ends (approximately 20 minutes after leaving the Site or upon closing all instances of your web browser), the data will only be used in a collated form and we will not be able to identify you personally from such data. Telephone calls and e-mail correspondence with Smeg at the email addresses accessible through, or obtained from, this Site may be recorded or monitored. By using these communication methods you are consenting to the recording and/or monitoring of your calls and emails. If you have purchased one of our internet-enabled ‘smart’ products, we may collect and handle personal information directly from such product when connected to the internet. The information we collect might include: information about how the product is used to help us review and improve performance. We may also collect information about your internet connection [and mobile device]. The information we collect may also include location data showing the location of your smart product. We collect this data so we can assess the environment in which the product is situated, to help us maximise performance of your product. You may contact us or comment on our products and services through social media. The information we collect from social media and online sites sometimes includes personal information that has been put online and is publicly available. Please refer to the relevant social media sites for details of their own privacy policies on how they collect and share your personal data. How do we store and protect your data? We will endeavour to ensure that the personal information you submit to us is kept private and secure, and held in accordance with relevant laws. We will not sell, rent or otherwise disclose the personal information you provide to us through the Site to third parties (other than as listed below) unless we are required to do so by law. Under the General Data Protection Regulation (GDPR) and The Data Protection Act 2018 (DPA) you have a number of rights with regard to your personal data. Please contact us [here] in writing if you have any queries in relation to your rights. In the event of a sale, transfer, merger, change of control, consolidation, reorganization or liquidation of Smeg, we may sell, transfer or assign to third parties information you have provided to us, including but not limited to personally identifiable information and other information concerning your relationship with us. Any information you post on the public areas of the Site (e.g. chat rooms, bulletin boards) is accessible to and used by others and may result in unsolicited messages or other contact from others. You are advised to use caution when posting personal information about yourself in public areas of this Site. Our Site is not directed at children and should not be accessed by them. We will not knowingly collect information from minors without their parent's or guardian's consent. From time to time our Site may contain links to and from the websites of our partner networks and affiliates. If you visit any of these sites, please note that they have their own privacy policies and you should check these before submitting any personal data. We cannot accept any responsibility or liability for these policies. As you navigate around the SMEG website we collect data such as the IP address of your computer and the pages you visit. This data is collected from all users in order to ensure that the site functions properly and that the visitors navigation experience is as easy as possible. SMEG do not collect any data for commercial purposes or in order to identify the visitor. The visitor remains anonymous. The cookies are stored in relevant logs and can only be disclosed to authorities, in the extreme case that it is requested by a court of law. What are Cookies? Cookies are pieces of information exchanged between a SMEG server and your computer and allow the creation of statistics on areas of the site visited by users anonymously. The collected data is then read in an aggregate form to understand the efficiency of the site and browsing experiences. Cookies used, therefore do not contain any personal information about users. The majority of browsers are able to detect new cookies and to ask the user for acceptance. If your browser has been set to not accept cookies then navigating the site would be difficult. 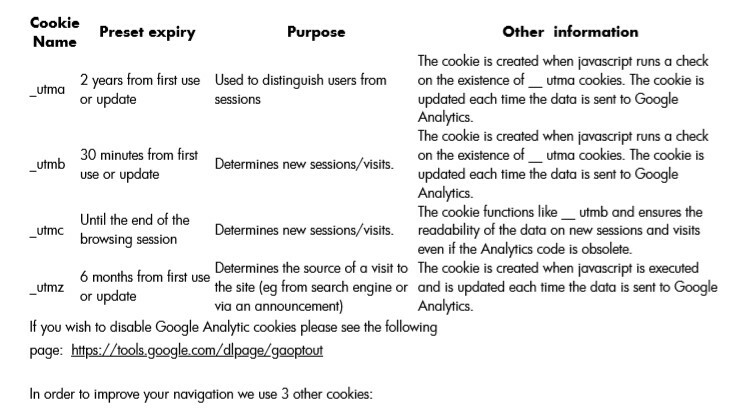 We work with third party suppliers who may also set cookies on our website, for example Google Analytics. These third-party suppliers are responsible for the cookies they set on our site. If you want further information, please go to the website for the relevant third party. You will find additional information in the table below. If you do not want to accept cookies, you can change your browser settings so that cookies are not accepted. If you do this, please be aware that you may lose some of the functionality of this site. For further information about cookies and how to disable them please go to the Information Commissioner’s webpage on cookies: https://ico.org.uk/for-the-public/online/cookies/.